Most little kids love dolls. So Truly Mine Doll is really cute and perfect for a Christmas present! Welcome tot he So Truly Mine Doll Giveaway! Be sure to swing by Jenns Blah Blah Blog and check out her recipe post – So Truly Mine Dolls | Gift Ideas for Girls Who Like Dolls to learn more about these fabulous dolls! One very lucky person will win their very own So Truly Mine Doll! The new line of So Truly Mine baby dolls is their FIRST collector-quality dolls and accessories specially created for children ages three and up. For 30 years, they have loved sharing our passion for collecting dolls with their customers and now it’s even more exciting to introduce the joys of their remarkable lifelike baby dolls to a younger audience. The dolls are exquisitely handcrafted of an exclusive RealTouch(R) vinyl and hand-painted to highlight their precious features, each realistic baby doll in the So Truly Mine line is specially designed and weighted to feel so real in a little girl’s arms. She can choose the hair color and the eye color of her So Truly Mine baby doll, create a custom birth certificate online and enjoy hours of playtime fun with the adorable So Truly Mine accessory sets we offer. 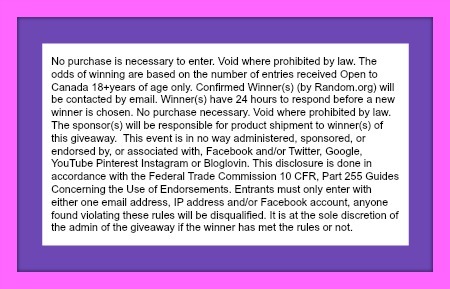 Giveaway is open to US residents, must be over 18 years of age to enter and use the below widget to enter. Giveaway will last until December 20th at 11:59 pm EST. Good Luck! « Diamond Candle or Cash Giveaway!